"This kale and seaweed salad is not only a blend of colorful greens, it is absolutely delicious for those who enjoy Japanese food." Rinse seaweed; soak in a bowl with water until softened, about 6 minutes. Drain seaweed; toss with 1 teaspoon of the sesame oil and ginger in a large bowl. Soak kale in a bowl with water to loosen dirt; rinse thoroughly. Chop kale into 1-inch strips. Heat 2 teaspoons of the sesame oil in a large skillet over medium heat. Add garlic; cook until fragrant, about 1 minute. Add seaweed mixture; cook until softened, about 1 minute more. Transfer seaweed mixture back to large bowl. Return skillet to heat; heat 1 tablespoon sesame oil. Add kale and liquid amino acid; toss to combine. Cover skillet and reduce heat to low. Cook until kale is just wilted, 5 to 10 minutes. Remove cover; cook and stir until excess moisture evaporates, about 1 minute more. 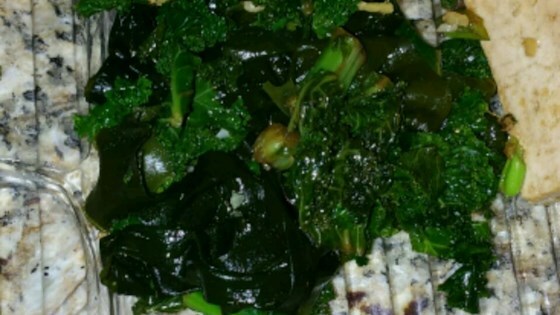 Add kale to seaweed mixture; toss to combine. Garnish with toasted sesame seeds. Refrigerate until chilled, 10 to 20 minutes. Dried food-grade seaweed can be found at markets such as Whole Foods® or at Asian grocery stores. Soy sauce can be substituted for the liquid amino acid, if desired. Be sure not to cook the kale too long; it can become mushy or burned.